The athlete who has had the biggest influence on my life, despite the fact that I only got the chance to see him play in person a couple times, officially announced his retirement from the game of baseball this afternoon. That man is Ivan “Pudge” Rodriguez who played 21 seasons behind the plate at the Major League Baseball level. In my eyes, Pudge is the greatest catcher to ever play the game (apologies to Johnny Bench who is the only player you can argue deserves that title) as he not only had very solid bat (.296 career average, 311 HR, 1332 RBI, and 2,844 hits) but the way he dominated defensively and controlled the opponent’s running game speaks even more volumes than his incredible statistics show. 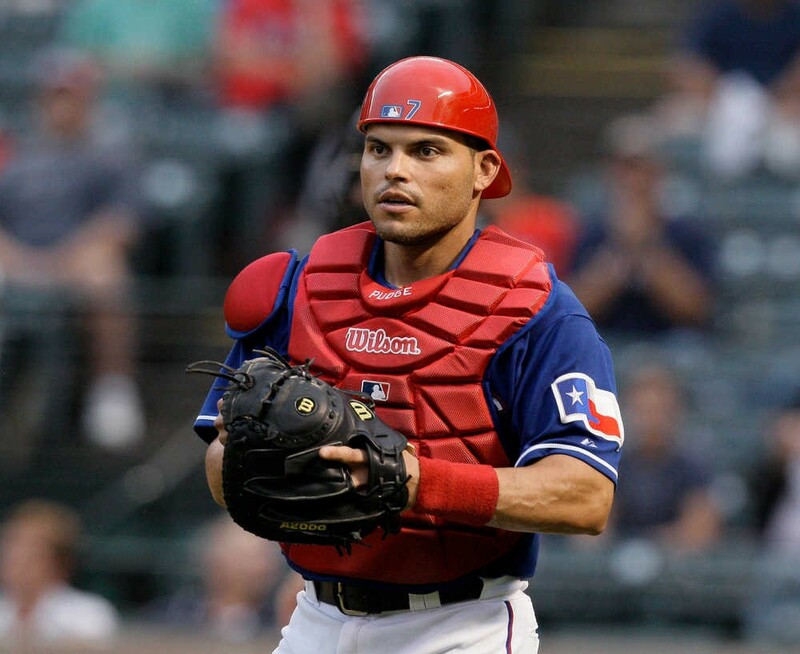 On November 30, 1971 Ivan Rodriguez Torres was born in Manati, Puerto Rico and was raised in Vega Baga, Puerto Rico, where his father worked for a construction company and his mother was an elementary school teacher. Pudge learned baseball at an early age and his biggest rival growing up was an outfielder who became one of his Texas Ranger teammates, Mr. Juan Gonzalez. As a Little League player, Pudge switched from pitcher to catcher because his father, the coach, thought he was throwing too hard and was scaring opponents with his pitches. Rodriguez later attended Lino Padron High School where he was discovered by Rangers scout Luis Rosa. Despite only being 16 years old, Rosa saw the leadership that Pudge had behind the plate and his ridiculously strong arm and invited him to a tryout where he impressed the Texas organization enough to offer him a contract. Pudge signed on with the Rangers in July 1988 and began his professional baseball career the next season with the Gastonia Rangers of the South Atlantic League. The Rangers knew what an incredible they had found, so Pudge’s minor league career did not last very long. After being selected as the best catcher in the Florida State League during the 1990 season (hitting .287 with 55 RBI) and also playing the Puerto Rican Professional Baseball League in the offseason, Rodriguez began the 1991 season with the Rangers AA minor league affiliate the Tulsa Drillers. After just 50 games there where he batted .274 and moved his way up to the #1 prospect ranking in the Texas organization, he was called up to the major league team before mid-season. On June 20, 1991 at the age of 19, Pudge became the youngest catcher to ever start a Major League Baseball game and went 1 for 4 with 2 RBIs for the Bobby Valentine led Rangers. He also threw out two runners trying to steal in his debut, a trend that would continue throughout his professional career. I won’t bore you with all the details of his MLB career, but a few stats can sum up most his accomplishments offensively. Over the 21 seasons he played, he was associated with 7 teams: Texas Rangers (1991-2002), Florida Marlins (won the 2003 World Series and the NLCS MVP in his lone season in Miami), Detroit Tigers (2004-2008), New York Yankees (second half of the 2008 season, I pretend this never happened and he probably does too), Houston Astros (first half of 2009), back to Texas (second half of 2009), and finally two seasons with the Washington Nationals (2010-2011). As I mentioned earlier he hit .296 for his career with 311 HR, 1332 RBI, 2,844 hits, a .798 slugging percentage, and 572 doubles. 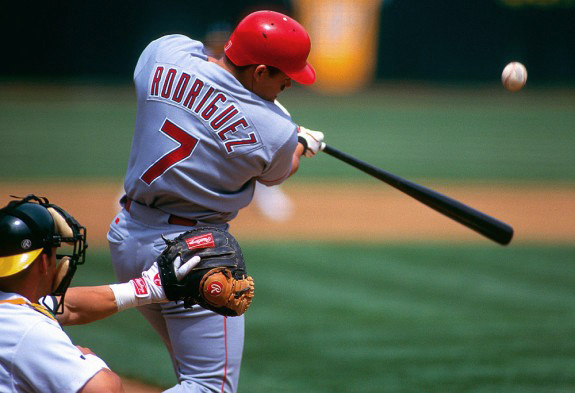 He won the American League Most Valuable Player award in 1999, was a 7-time silver slugger recipient and a 14-time all-star. Defensively is really where Pudge set himself apart from every other catcher in Major League Baseball history. Pudge won 13 Gold Gloves (most by any catcher in history) during his career and that doesn’t even tell the whole story. He had one of the strongest arms of anyone I have ever seen play the game, and he routinely threw harder than his pitching staff, whether throwing to try to get a base-runner out or at times gunning the ball back to his pitcher in attempts to motivate him to throw harder. His strong arm and quick release (he had a patented snap-throw that all runners needed to respect) made Pudge the most effective catcher at controlling oppositions running game. And when teams did tried to steal on him, well, that was a mistake, as there was a pretty good chance he was going to throw you out. Over the course of his career, Pudge threw out 42% of the runners attempting to steal on his watch. To put that in perspective the league average since he entered the league is only 26%. Rodriguez also wasn’t afraid to block the plate, and generally went about the game the right way, playing all 27 outs on both sides of the plate as hard as he possibly could. Watching the way that Rodriguez controlled the game from behind the plate was a major reason that I decided to become a catcher even though it is the hardest position in the game to play. I see the game of baseball differently because of the impact that Pudge had on the sport. There was no greater feeling for me than making a perfect throw to third to gun down a runner trying to steal and the way that Pudge made it look so easy motivated me to get better each and every time I took my position behind the dish. I’m sure it also helped that as a player I relied on my speed and loved to steal bases myself, but the kind of satisfaction that I received from throwing runners out on the base paths is something that really cannot be replicated anywhere outside of baseball. For everything that Pudge accomplished during his fantastic career I am hoping that the Hall of Fame voters will induct him on the first ballot when the times in 2017. Until then it is time to watch my new favorite catcher, the Giants Buster Posey continue to learn the position and get better, and hopefully one day he will be mentioned in the same sentences as Ivan Rodriguez as one of the greatest to ever play the position. Thanks for the memories, Pudge! 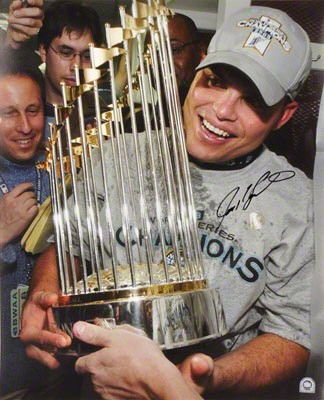 Pudge celebrates with the Commissioner's Trophy, awarded for winning the 2003 World Series with the Florida Marlins. This entry was posted in MLB and tagged Baseball, Ivan Rodriguez, MLB, Pudge, Pudge Rodriguez, Texas Rangers. Bookmark the permalink.